Eye creams are something I've never really delved into. I always saw them as something for more maturing skin but lack of sleep has always left me with dark under eye circles. Now they're by no means the worst but I know they're there and it can get me down. I've yet to find a concealer that doesn't crease on me so I've been looking for other options. FaceD are releasing a unique new cream on September 28, that helps to banish dark circles in just half an hour, the Anti-Dark Circles Eye Cream*. FaceD 3-LURONICS Anti-Dark Circle Eye Cream, the first ever treatment to act simultaneously on all major flaws around the eyes, is proven to have an immediate but also lasting effect, banishing dark circles in just 30 minutes as well as reducing sagging and wrinkles in just 56 days. Part of the best-selling FaceD 3-LURONICS range, the cream will launch in the UK on 28 September available exclusively at LloydsPharmacy. Used first thing in the morning the cream’s special formula improves microcirculation, which reduces puffiness, leaving your face looking fresh and rested with no need for concealer. It can also be applied last thing at night as it continues to act on wrinkles and sagging while you sleep for lasting results. I will admit that I haven't trialled this cream long enough to see if it lives up to long term claims. But I will say that currently I've been loving it, especially in the morning. It's a very cooling cream so it feels wonderful on puffy, tired, morning eyes. The cream itself is on the thinner side but it isn't extremely runny, just the right consistency. The first thing I did noticed about this cream is that it's scented. It's not on the level of YSL and my eyes can be quite sensitive but it has no effect on me. Just a word of warning if you have extremely sensitive eyes. 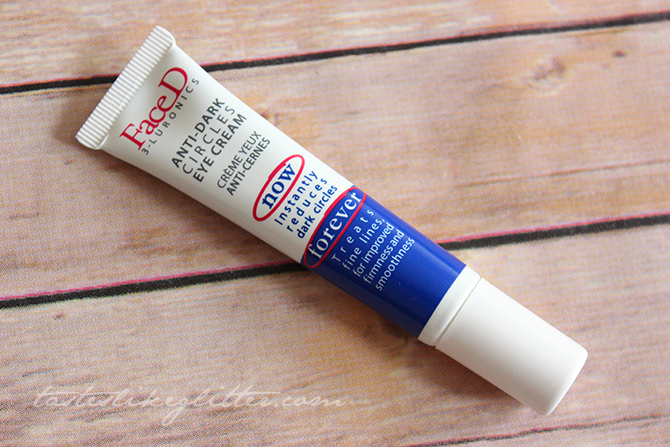 A little bit of this cream goes a long way so I can see this tube lasting quite some time. As for my dark circles, I do find it's really been helping and it's been making my eyes feel a lot more 'comfortable' in the morning. Which sounds like an odd thing to say but if you suffer from not sleeping well, when you wake up you can be left with dry, uncomfortable eyes and this eye cream helps to combat that. Overall I'm glad to have this, I just need to remember to use it as I'm not used to using eye creams. If you've been on the lookout for a new eye cream though, I can definitely recommend this one.